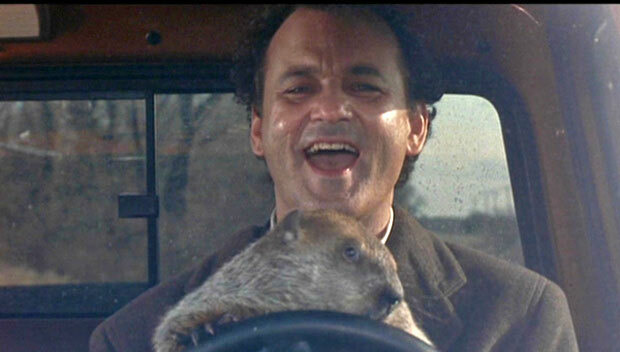 The movie “Groundhog Day” is about a man (Phil Connors, played by Bill Murray) who is stuck in a time loop, reliving the same day over and over again. The people of special rural Wattle Grove must feel a bit like the character Phil Connors – stuck in a bad version of this film with the Shire of Kalamunda’s recent decision to initiate the rezoning of 32 Gavour road, Wattle Grove (Amendment 57) for the fourth time. This proposal was before council in 2004, 2007, 2009 and 2013. That’s 4 times in less than 10 years. Residents now have less than 60 days to make a submission outlining their concerns. Nothing seems to have changed with the latest proposal. The documentation submitted by the proponent is 297 pages long and leaves people with the impression that something specific is going to be built. This begs the question – Is there any guarantee of high-end aged care accommodation being built on the site? At the end of the day, I believe we’re still dealing with the same flawed proposal. If approved by the Shire of Kalamunda and the Minister for planning (John Day), it will give way to a dense urban development in the middle of a special rural area. And if poor planning decisions can happen here, they can happen anywhere. The land cannot be serviced by reticulated sewerage system. The Shire of Kalamunda has finally conceded that fact, as advised by ratepayers and the Water Authority since 2009. 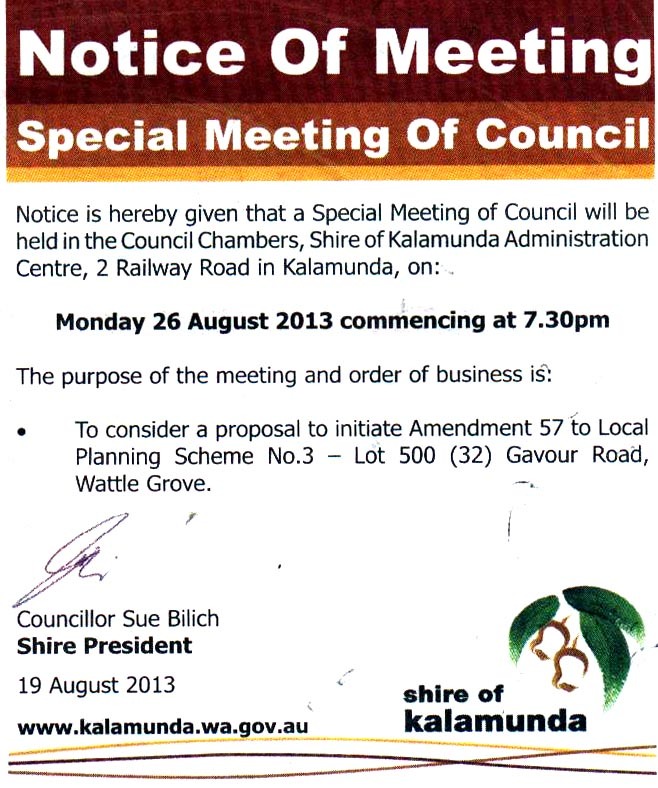 The Amendment is inconsistent with orderly and proper planning of the Wattle Grove locality and the Shire of Kalamunda by reason of its ad hoc and incremental approach to planning and development (Stated by the Secretary of the Western Australian Planning Commission on the 14th July 2009 in respect to 32 Gavour road, Wattle Grove). The rural zone of the metropolitan region is an inappropriate location for aged persons accommodation and facilities, which should be provided within or contiguous to established or planned urban areas with ready access to facilities and amenities and closer integration with established communities (Stated by the Secretary of the Western Australian Planning Commission on the 14th July 2009 in respect to 32 Gavour road, Wattle Grove). This proposed rezoning conflicts sharply with the rural character of the surroundings and is inconsistent with orderly and proper planning. The land use and development facilitated by the proposed amendment would constitute an undesirable precedent for use and development of the locality and foothills generally, especially having regard to the current lack of urban services and utilities including readily available reticulated sewerage (Stated by the Secretary of the Western Australian Planning Commission on the 14th July 2009 in respect to 32 Gavour road, Wattle Grove). I encourage everyone to make a submission to both the Shire of Kalamunda and the Western Australian Planning Commission (WAPC) outlining their concerns. Submissions are due by the 30th of May 2014. You can download a submission form here.